Julia Turshen: My name is Julia Turshen, and by latest cookbook is called Now & Again: Go To Recipes, Inspired Menus, and Endless Ideas for Reinventing Leftovers. Suzy Chase: The last time we chatted on my podcast we were talking about Feed the Resistance. With your latest cookbook, Now & Again, I noticed some themes from Feed the Resistance also in this cookbook. What are the three goals you had in mind while writing Now & Again? Julia Turshen: When I sat down to write Now & Again I had three goals in mind. The first was to dismantle the idea that making a full meal, cooking an entire menu, had to be both difficult and expensive. My second goal was to really show that leftovers are great, and that they're an invitation to fun and inventive cooking. The final goal was just to make sure you had all the tools you need. Both the inspiration and the information to bring people into your home and around your table, because to me that's the best part of home cooking. Suzy Chase: You have such diversity in this cookbook, from a Sunday morning Bangladeshi breakfast, to a steakhouse dinner for vegetarians, to tortilla soup for a chilly spring evening. Now you gathered 150 recipes to develop 20 menus. How did these recipes make the cut? Julia Turshen: That's a great question. You know, I think they made the cut so to speak if each menu felt really kind of perfectly composed. I started the book by writing down the menus and the ideas of the menu before I wrote down each and every recipe. The steakhouse dinner for vegetarians, which is one of my favorite menus. It always makes me laugh whenever I say it. I had that idea for a menu and I had one or two of the recipes in mind. But the rest kind of filled themselves in so to speak. I started kind of with, I guess you'd say kind of the framework. The menu or the meal, and then I kind of filled in the blanks. Suzy Chase: Let's say it's a random Monday and you're thinking about cooking dinner. You tend to cook a few things, not just one. Walk me through your process. Do you get inspiration from what's already in your fridge and pantry? Do you wander around the grocery store? Do you ask Grace what she wants? How do you do it? Julia Turshen: Yeah, sort of all of the above. It's never always the same formula, which is part of what I love so much about cooking at home. The inspiration can feel different everyday and the needs can feel different. But I guess at the end of the day, we have to eat dinner, and we're lucky to be able to. I kind of start from, yeah, usually what's there. What's the one thing in the fridge that needs to be used up? Is that something leftover? Is that an ingredient I haven't gotten to? I really, I hate throwing things out, which was a big part of where this book came from. Usually it is starting there. What's the one thing that needs to be used up? Then I sort of plan around it. Just as I said, I don't usually just make one thing. I'm a big fan of making a meal that has all sorts of things that compliment each other, and that does not need to be complicated or time consuming or expensive. It can be as simple as a bag of potato chips and an apple to go with my sandwich at lunch. It can be a green salad next to the roast chicken I make. Whatever it might be, I like just sort of rounding out the meal and not having just one single dish. Suzy Chase: Have you always been intrigued by the idea of connection with dishes on the table and the people around it? Or did this kind of surface while you were conceiving Feed the Resistance? Julia Turshen: I would say I've always been interested in that sense of connection, before I even had the words to describe that. I talk about in the book that my favorite way to sort of pass the time when I was bored in class when I was in school, you know, as I think we've all been before. My favorite way to pass that time was to write menus, like in the margins of my notebooks. Just to imagine meals. That sense of connection between dishes. I would also think about who I would want to invite. Whether those were friends of mine in school, or I have notebooks from high school where I wrote kind of fantasies of meals. You know, fantasized about the types of friends I might have one day. That's always definitely been part of what has always drawn be to the kitchen and to cooking, is imagining the connection between both the dishes on the table and then the people around the table. But I would say that real sense of community definitely crystallized for me when I wrote Feed the Resistance. Not really me writing it, but more me collecting all the people who wrote for it. Bringing together all those recipes and essays and really being in community with all the contributors. Then seeing that sense of community just expand almost exponentially when I got to promote the book and go around on tour and meet people, and just talk about the power of food to bring us all together. I would say it threads through my whole life, but I think it's really felt more important to me than ever in the last few years. Suzy Chase: As a home cook it's such a relief that you wrote Now & Again in plain English. There are no rules here. We can make a full menu, or we can mix and match from various menus in the cookbook. Talk a little bit about that. Julia Turshen: Sure, yeah. The book is, it's broken down into seasons. Each season has a bunch of menus and each menu has all the recipes to make those menus. I wanted all the recipes to be both appealing, but also really easy to make, so that if you wanted to make each and every recipe and make that whole menu, that would be totally doable. You wouldn't strain yourself in doing that. But I also feel very much that one of the best things about cooking at home is having freedom and agency to do whatever you want. If you want to pick one dish from one menu and mix it with another, or if you want to change some ingredients in a recipe, whatever you want to do is fine with me. My goal is just to hopefully help encourage you to be excited to be in your kitchen and invite people over. I feel so strongly that any cookbook reader, whether you're working with my book or someone else's, if you're going to spend money on ingredients and time preparing a recipe, that should be money and time really well spent. Hopefully you're really happy on the other side of it. I want provide recipes that you can trust, but I also want to provide the framework to make you excited to cook, and to use whatever makes you feel good. If I call for, I don't know, say cilantro and something, and you're someone who hates cilantro. My mother, for example. I would not expect you at all to use it. Use a different herb or leave it out. There's no sense in making something you're not going to enjoy, because not only will you not enjoy it. It might dissuade you from cooking something else again soon. I'm all for recipes as kind of inspiration and helpful guidelines, but I don't see them as prescriptions. I think that you've got a lot of agency when you're in your kitchen. Suzy Chase: Well and I think it's great for the home cook that's not that confident in the kitchen, so you can make your whole menu, and when you get more confident you can start mixing and matching. Suzy Chase: You can grow with it. As you wrote in the beginning of the cookbook, you originally started out writing a leftovers book. You were going to call it, drum roll please, It's Me Again. I love that name. It's so cute. With every menu you have It's Me Again tips, which is a brilliant idea. Julia Turshen: Yeah. I was going to just have a small kind of really fun book that was just going to be about reinventing leftovers. I came up with that title, It's Me Again, and thought it was the funniest thing I've ever thought of. Suzy Chase: I love it. Julia Turshen: Yeah. I sort of fell in love with that idea. But then the more I got to work on it, I realized it just wasn't enough, because it was sort of giving you the after without giving you the before. It was telling you how to reinvent something without giving you the something. The book evolved and it became this much larger book, and I believe truly a much more useful one, and I think more meaningful one too because I got to include just so many personal stories and memories with all the menus. But I did get to still hold onto It's Me Again. All those leftover ideas follow each menu. The way it works is, every single menu has all of the simple recipes to make it, and then it's followed by these ideas of what to do with things that are left over from the meal. Some of them are super simple. There's an arugula salad in one of the fall menus, and it's just dressed really simply with lemon and olive oil and it has some toasted pine nuts and parmesan cheese. Leftover salad is something most people I think don't see much potential in. It's wilted. The texture is not really that great. It's a little bit soggy. It's not real appealing. But to me when I see that I don't see a soggy salad. I see the base of a delicious pesto, so I just throw that all in the food processor and just add a little bit more olive oil if it needs, and turn it into a wonderful pesto. You can spread it on grilled bread, toss it with pasta, eat it with roast chicken. Whatever it might be. I think that's a really good example of really transforming something. Something that you might think has no more worth, and all of a sudden finding tremendous value in it. That's kind of the crux of all the ideas. Really seeing potential for new life and transformation in leftovers. In a funny way, I mean I guess it's not funny, but in a serious way, Now & Again is, it's a book about food waste without ever saying so. It's not a book about what you're doing wrong by throwing anything out. It's I think an encouraging book about what you can do with the things you might throw out. Suzy Chase: In the back of the cookbook you have a chapter called Seven Lists. Describe this. Julia Turshen: Sure. This was one of my favorite parts of the book. Each list has seven items on it. It's nearly 50 kind of, what I think of as extra ideas. I think of this section as kind of like the bonus content. These are written in a very, I would say much more kind of informal way. They're not strict recipes whatsoever. They're just ideas. They range from seven things to do if you have leftover wine, which some people say is not a thing. But if you do have leftover wine there's fun ideas for ways to use it. Poaching eggs in wine. Cooking spaghetti in it. Braising pork. Then there's seven things to do with leftover cooked rice. Seven things to do with produce that's kind of on its way out. Then seven things to bring if you're invited over to someone's home for diner. Then the last list is just less of a cooking one, but it's seven things that you can delegate when you're having people over. Suzy Chase: That's my favorite. Julia Turshen: Exactly, yeah. I think it's one of the best things to ask someone to bring, because if you're like me, I don't have a very big freezer so I don't have room to store a ton of ice. It's not something you can buy in advance because you can't really put it in your cupboard. Yeah, I love asking someone to bring it over, because it's not an expensive thing but it really saves you time, and it means you're not running out of your house or leaving your kitchen just before you're about to have people come over. I, like I think a lot of other home cooks, struggle with delegating. It was just helpful to put down a bunch of ideas and remember that you don't have to do everything. It's okay to ask for help, and it's actually great to ask for help because I think it makes other people feel just as invested in the meal. Suzy Chase: I think this comes from seeing our moms and grandmas doing everything, don't you think? Julia Turshen: I guess so. I mean, I didn't grow up with a mother or a grandmother who cooked very much. But I think I definitely saw that happening in other areas. Not so much in the kitchen. But yeah, for sure. I think women in general take on a lot, and I think they take on a lot of responsibility and feel a big sense of obligation. Sort of like we were talking about a few minutes ago, I think everything's better when we're in community. Whether that's a meal or work or whatever it might be. I think asking for help when you need it, offering help when you can. These are all great things. Suzy Chase: In this cookbook you have integrate so many of your family photos. One that I love was, you taught your grandmother and her friends how to make fruit salad. That was so cute. Suzy Chase: You also incorporated your great grandmother's playing cards. Talk a little bit about your maternal grandmother's candlesticks. Julia Turshen: Sure, yeah. One thing that is so amazing about getting to create a cookbook is getting to kind of weave in all these little bits and pieces. A cookbook's not that much unlike a big quilt, and you get these opportunities to sort of put in little bits of your history. It's something that means a lot to me. In the spring section of the book there's a whole menu for Passover, which is a Jewish holiday that I've spent my whole life celebrating with my family. My mother's parents were immigrants. I mean really they were refugees. They fled eastern Europe during the pogrom, and ended up in America. They did not have the chance to bring all that much with them, but one thing that my grandmother did bring with her was her set of candlesticks. She is long passed, and I actually never had the chance to meet her. But she passed down her candlesticks to my mother. Then at every Jewish holiday, or even at other holiday celebrations that we would have at my parents' house growing up into my kind of early adulthood, my mom would always take out the candlesticks and light them. When I was doing all the photographs for Now & Again, I knew I was going to have this Passover menu. I really wanted to have a picture of those candlesticks in there, and it just felt like it would feel special. Whether or not even anyone realizes their significance, it just felt really important to me that they were in there. My mom came over for the day when we were doing those photos, and she brought her candlesticks. Then when she was leaving I went to wrap them up and give them back to her, and then she told me I could keep them. Julia Turshen: Which I can't say without crying. Julia Turshen: Yeah. It was just so sweet. They now live in my living room, and they're very proudly on display. I'm so happy to have them. Just touching them makes me feel connected to my family, and to family I never even got to meet but I feel so strongly tied to. Suzy Chase: Well you're preaching to the choir, because every piece of furniture in my apartment I had growing up in Kansas. I can't get rid of all of my family furniture, so I get it. Julia Turshen: Nor should you. I think that's amazing you have it, and I think these things we get to hold onto, whether it's a piece of furniture or a candlestick or a recipe, they have huge meaning. I think food is sometimes something we just eat when we're in a rush to go somewhere and we're hungry. I think at times it can just take on such a major significance. That really just again kind of fosters that sense of connection we were talking about. Suzy Chase: The other night I made some dishes from your No Stress Thanksgiving Menu on page 63. Suzy Chase: Describe this menu, and talk a bit about how Thanksgiving has come to be your newest tradition. Julia Turshen: Sure, yeah. The Thanksgiving menu I called the No Stress Thanksgiving, which is words you don't always find together. I have been cooking Thanksgiving since I was really young. 10 or 11 years old. The kid who was teaching herself to cook, Thanksgiving was always the day during the year I most looked forward to, and I think the day when I was most trying to show off these skills. Looking back on it I think it's kind of funny to think that I, the longer I've cooked and the older I get, the more simple my cooking is. I was sort of a fancy, or wannabe fancy kind of kid and teenager. Really trying to show off. I think my cooking has gotten simpler, and that's something I try to really push forward in my recipes, because I think your meal can still be so wonderful and delicious and satisfying, and make people excited to eat, and it can also be really to make. That's sort of the feeling behind the recipe. That I would say even after these now couple decades of making the meal, the tradition that I've incorporated that means a lot to me is looking into organizations like, there's one called Women Empowering Women For Indian Nations. Another college fund for Indigenous Americans. Looking up these organizations and donating to them. In doing so, I think it's really acknowledging, Thanksgiving has always been this really joyous day for me and my family. This day when we're all so happy to be together and eating this food we all love. But acknowledging at the same time, I think it's a day that brings up not great memories for other Americans. I think in fully recognizing that and doing what I can to hopefully extend some of my privilege, it means kind of holding the good with the hard and having a deeper kind of understanding of the holiday. It also inspires me very much to think about who's at my table, and to make sure I'm welcoming as many people in my family and my community as possible. That's my newest tradition, which I guess I started doing a few years ago now. It's one that feels very important. Suzy Chase: Okay, now to my segment called My Last Meal. If you had to place an order for your last supper, what would it be? Julia Turshen: If I had to place an order. So I'm not cooking it? Suzy Chase: Well you know what, that's a darn good question. You could cook it. If you could cook your last meal, if you wanted to, what would it be? Julia Turshen: This is always such a funny question. I kind of like the idea of maybe not cooking. But I do enjoy cooking so much, that I think if I had the option to cook it I think I would take that option. I think it would just extend that time a little bit. I guess, I mean the first thing that came to mind is, maybe because we're talking about Thanksgiving, is a roast chicken. Just a really really good roast chicken, and lots of delicious bread to kind of sop up everything that's in the pan. Roast potatoes and carrots and parsnips, and all that kind of stuff. Maybe a really tall coconut cake for desert. That would make me really happy. Julia Turshen: My website is just juliaturshen.com, and everything about my books and my work is there. Then I'm on Instagram and Twitter, @turshen. Just my last name is my handle. Suzy Chase: It's always so amazing talking with you. Thanks so much for coming on Cookery By the Book Podcast. Julia Turshen: Oh, thank-you. Thank-you so much. This was really fun. It's always great talking with you. 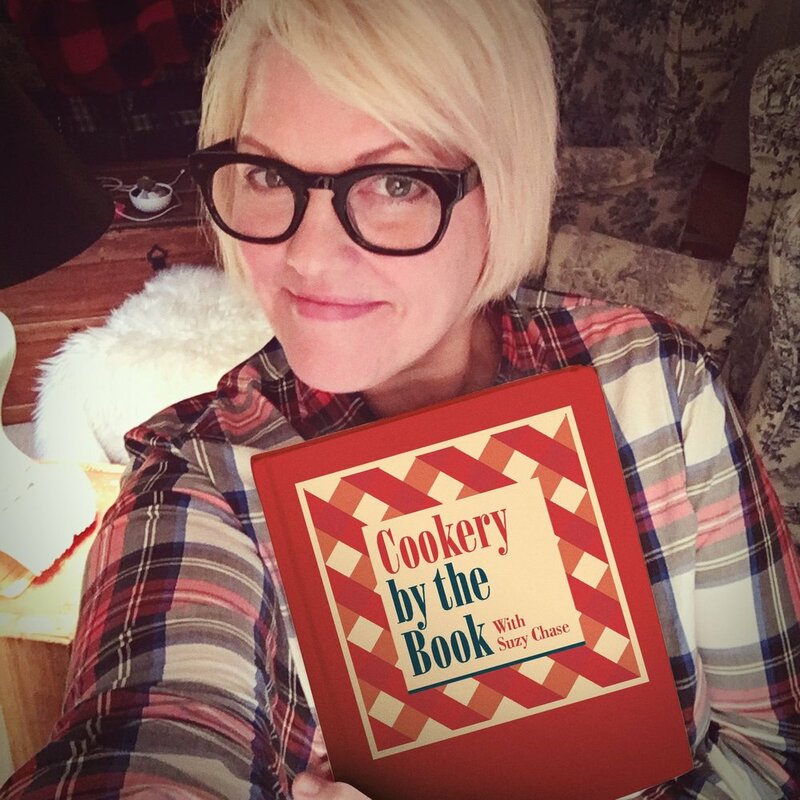 Suzy Chase: Subscribe in Apple Podcasts, and while you're there please take a moment to rate and review Cookery By the Book. You can also follow me on Instagram, @cookerybythebook. Twitter is, @iamsuzychase. Download your Kitchen Mix Tapes, music to cook by, on Spotify, at cookerybythebook. Thanks for listening.